Looking for a fun way to help kids develop their number recognition and counting skills? 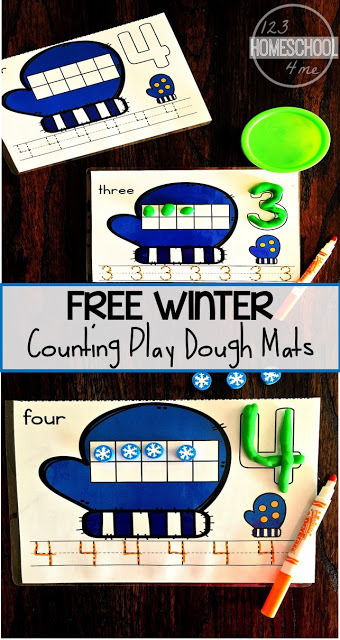 These fun Winter Play Dough Counting Mats will be a big hit with your students. Combine play dough with anything and the kids will just jump at the chance to get involved. 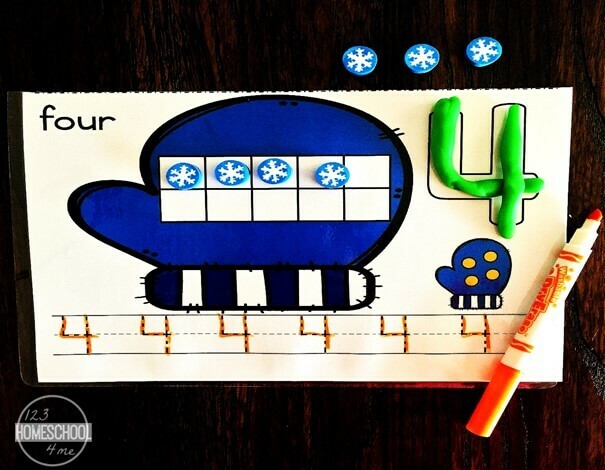 Print as many of these Winter Play Dough Counting Mats as you need for the set of students in your class. These mats have to laminated so you’re able to use the dry erase markers on them. Have colored play dough tubs ready at the table along with some dry erase markers. Students will count the number of snowballs there are on each mat (bottom right). They will then match the number with play dough balls onto the ten frame found on the mitten. They then will trace the numeral found on each mat at the bottom. For students working on one-to-one correspondence, I think it’s essential they count each snowball as they point to it before they begin making dough balls to place in the ten frame. Some students will not be ready to work on their numbers to ten so you can definetly differentiate this activity by providing the beginners with number mats 1-5. Monitoring how they work on the mats is also essential. You can also totally use mini erasers or other manipulatives on these mats for further practice. I like using these on the ten frame and then have the kids use dough on the numeral. Whichever way it is used, it helps students develop their fine motor skills as well as their counting skills. 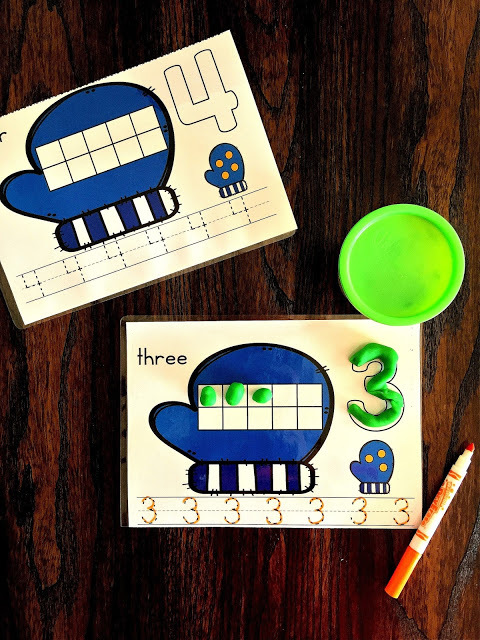 Another way you can use these mats is to have the students use a dry erase marker to fill in the numeral rather than play dough, or use buttons to fill it in. There are endless ways to use these mats!